It makes me feel kinda warm and fuzzy that the nominee for Treasury Secretary, Timothy Geithner, who essentially will be in charge of the IRS, and who is supposed to be a financial genius, made an "innocent mistake" and failed to pay $34,000 in taxes between 2001 and 2004. If financial geniuses can make $34,000 mistakes on their favor, get audited by the IRS, get off a couple of years' worth of back-taxes, and then become the IRS' boss, things are good for the rest of us "regular" financial types. But, since some of Geithner's mistakes were forgiven by the IRS because of the statute of limitations, he actually got off not paying off some of his back taxes. I hereby call for Geithner to donate that tax amount that he should have paid, but didn't because of statute of limitations, to the Smithsonian Institution. The McLean Project for the Arts in Virginia is offering a January session as well as Winter and Spring sessions of Open Studio -- Live Model Drawing. "For the last month, Americans for the Arts has been working with the field, Congress, and the Obama Transition Team to include support for the nonprofit arts sector and individual artists in any federal economic recovery package. With your help, we have been compiling examples of how the recession has affected arts groups. We are getting this compelling information along with our economic impact data into the hands of key policy leaders in Washington. Last week, Americans for the Arts officially proposed Nine Recommendations for Economic Recovery & the Arts to help nonprofit and governmental arts groups as well as individual artists during this economic downturn. Today, Americans for the Arts President and CEO Bob Lynch met with the Obama Transition Team to discuss these and other ideas. Also today, the House Appropriations Committee released an $825 billion economic recovery package. Included in the proposed bill is an infusion of $50 million for the National Endowment for the Arts (in addition to its annual appropriations) to specifically preserve jobs in the nonprofit arts sector threatened by declines in philanthropic and other support. The House plan proposes additional opportunities throughout other parts of the federal government that could also help the nonprofit arts sector and individual artists. Many of these other opportunities correspond closely with our Recommendations for Economic Recovery & the Arts." More on my expectations of Steven Soderbergh's Che, which bring some prejudices, notions, knowledge, facts, and ideas about how a film should depict Guevara. 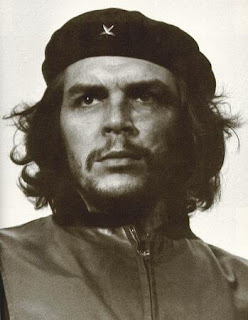 Alberto “Korda” Díaz’s image of Che Guevara as saint, guerrilla, and fashion statement is considered to be the most reproduced image in the history of photography. The stunning documentary film, Chevolution (Red Envelope Entertainment, 2008), codirected and produced by Trisha Ziff, explores how and why this image became so important. Through original footage, notable interviews, and a look into vast archival collections of Che images, this film tackles the complexity and contradictions of what this important photograph still means today. Ms. Ziff is a curator of contemporary photography, filmmaker, and Guggenheim scholar who lives and works in Mexico. Following the screening, she discusses the film and takes questions from the audience. The lecture is January 21, 2009 at 7PM. Sign up for the lecture here. That photo of Che by Korda has been commercialized beyond belief, and Korda never received any compensation from the appropriation of his image. A few years ago, just before he died, the Cuban dictatorship allowed him to sue a French company and prevent the use of the image on a "Che" Vodka. A couple of years ago I helped one of the collectors that I advise to acquire a huge collection of vintage Korda photographs which were his private copies and proofs and which passed to his daughter upon his death. They are now safe in a private collection in West Palm Beach and she received some good money for them. 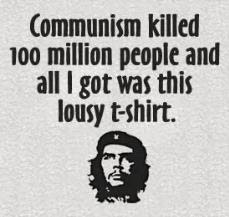 But from the millions of Che T-shirts and posters and endless reproductions of the photograph, Korda never received a penny. I find Jen Blazina to be one of the most interesting artists from the Greater Philadelphia area. Last year she was awarded two residencies: the Frans Masereel Centrum in Belgium and a National Endowment for the Arts Grant to attend a fellowship at The Women's Studio Workshop. 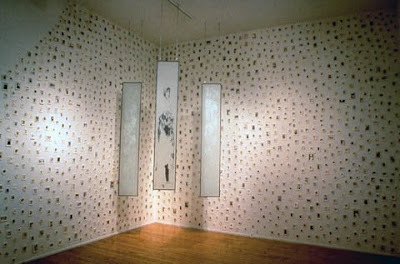 Before that Blazina has been awarded numerous other residencies including: Women's Studio Workshop in New York, in 2006; Scuola di Grafica in Venice, Italy; Kala Art Institute in Berkeley, CA, in 2005 and 2007; The Creative Glass Center of America's Residency Fellowship for 2003 in New Jersey; Millay Colony for the Arts in New York. She has also been awarded numerous grants including the Leeway Foundation Grant, the Maryland State Arts Council, and the Independence Foundation Grant.